Mazda RX8 Big Brake Kits and Wheels and Accessories. Mazda RX-8 Performance Parts. ICR Pro four high performance slotted ( not drilled , which causes cracking ) stock sized rotors. Includes all four rotors for your performance street or track 2004 - 2009 Mazda RX-8 for the ultimate in stopping performance. 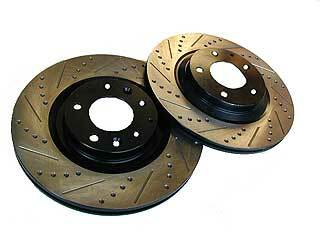 Higher quality steel than OEM rotors to allow longer life and better stopping power. 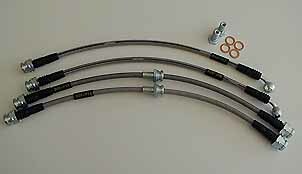 Kit comes complete with all four rotors, high performance HP brake pads and a complete steel braided brake line kit. Includes all needed hardware. ICR Pro four high performance slotted ( not drilled , which causes cracking ) stock sized rotors. Includes all four rotors for your 2004 - 2009 performance street or track Mazda RX-8 for the ultimate in stopping performance. Bolts right on using stock brake pads or aftermarket pads. Higher quality steel than OEM rotors to allow longer life and better stopping power. Fits your high performance 2004 - 2009 RX-8. Really stiffens your spongy brake pedal. Includes all needed hardware for your performance street or track Mazda RX-8 for the ultimate in stopping performance. Fits your high performance 2004 - 2009 RX-8. Friendly to your rotors with very little brake dust too. Includes front and rear pads and all needed hardware for your performance street or track Mazda RX-8 for the ultimate in stopping performance.